It was so much fun to get Frances of Nonsuch Book and Simon together in the same room. Even more fun is that we recorded a very special episode of The Readers with Frances telling about her experience as one of the six female bloggers who decided to read the Booker long list in their (Wo)Man Booker Shadow Panel. She also came bearing bookish gifts. Not surprisingly, many of them were Booker related. The bottom two were Booker long list books that sounded interesting to me. 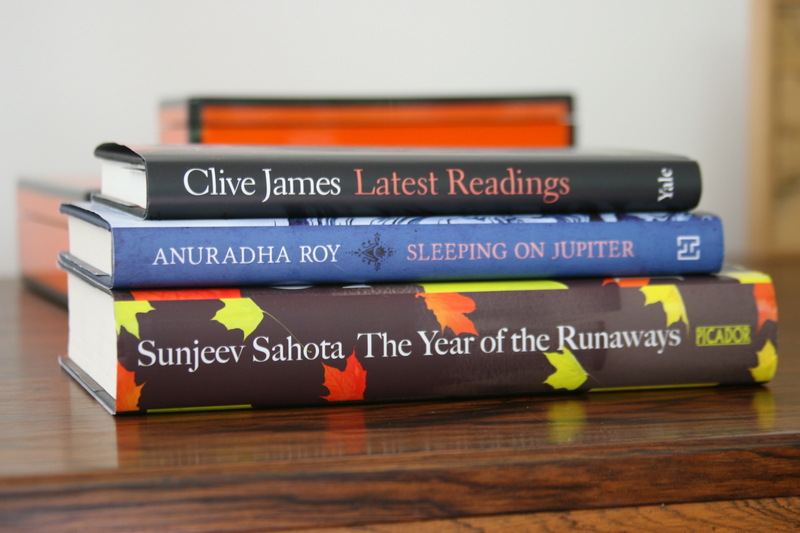 Simon almost took the Anuradha Roy, but when I expressed a slight interest in it I think he thought about his giant pile of books that he had to schlep back to the UK and decided to let me have it. The Clive James I passed over just because I find him slightly obnoxious. But then Frances told me it was about his reading choices and behavior after being diagnosed with a terminal illness. Seems kind of morbid that that would pique my interest, but it isn’t the first time I thought about end of life reading. When I read The Hopkin’s Manuscript by R.C. Sherriff back in 2011 I posed a question to readers about what they think they would want to read as they waited for the end of the world. I will be interested to see what Clive James chose. Love James’s approach to the end in that he is less concerned with cramming in the things he has yet to get to and more occupied with the books he has treasured and the paths they point to as he continues to accumulate books. I had mixed feelings about him personally before reading this but then completely fell for the optimism of his reading and acquisitions when faced with the end. Unfortunately, he has me searching for a few hard to find items now. He has reconfirmed for me how un-serious I am as a reader. Especially as it comes to poetry. I know Clive can be irritating on occasions, but when he is on form he is superb. Not only is he very funny, but he really can laugh at himself which is a wonderful quality. Every sin is forgiven when I read “Unreliable memoirs”.